On Tuesday June 19, the Charities Review Council held its Annual Forum—a yearly meeting dedicated to not only publicly reporting the activities and accomplishments of the organization, but to also give space and recognition to pivotal topics affecting our communities. This year, the Council structured the event around the idea of “Building a Foundation for Social Change” by inviting Luz Vega-Marquis, President and CEO of Marguerite Casey Foundation, to speak on the critical role capacity building and effective partnerships play in building a foundation for change. The program also included awarding the annual “Community Leadership Award” to Greater Twin Cities United Way for continued support and encouragement for accountability and transparency in the nonprofit sector. Before Ms. Vega-Marquis took the stage, there was a heartfelt recognition and standing ovation for the Council’s executive director, Rich Cowles, as this was the final Annual Forum before his end-of-June retirement after a 13-year tenure as the organization’s leader. 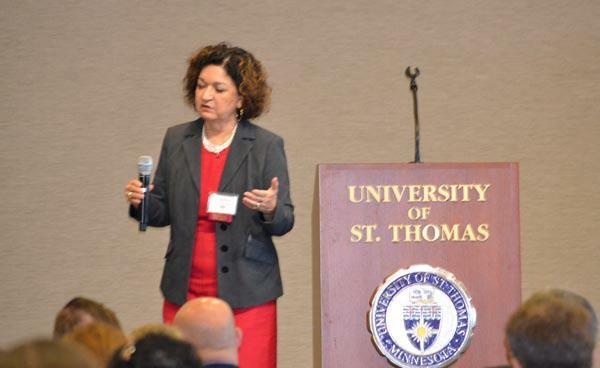 Speaking to a room of over 300 influential people in the nonprofit, philanthropic, and business communities, Luz Vega-Marquis shared her outlook for better serving the impoverished people of our country. As the keynote speaker at our 2012 Annual Forum, she addressed the growing problem of the treatment of poverty in our country. With a staggering 49 million people living in poor conditions, it is very important to listen to those families in our communities and to keep the epidemic at the forefront, Vega-Marquis said. To ensure that poverty remains in national discussions, Marguerite Casey Foundation maintains a staff reporter to inform leaders of the ongoing struggles for low-income families. She has seen too many instances where someone has sought help and they are transferred between specialized networks, rather than given the assistance that they needed, she said. “These people aren’t just reeling from a hit that solely affects their housing choices. They are hit with everything coming down around them in one big swoop. Networks that specialize in housing, food, and job concerns must become that collective capacity to help that family,” she said. Understanding the impact on the families and building an infrastructure are just some of the ways that organizations can better serve low-income families, Vega-Marquis said. “We need to envision something grand,” she said. If we collect the political power of the poor, it will make these families proud to belong to something and build their participation levels in our society. Getting to know Kris Kewitsch!